Verdicchio Ristorante | Enoteca was recognized as a Local Food Champion at the annual Eat Local Fall Harvest celebration. The restaurant received the top honours in the Business, Institution Restaurant Category for doing its best to put local food on the menu. 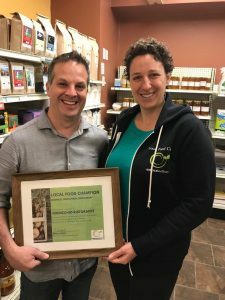 Mark Gregorini, Manager Operator of Verdicchio Ristorante | Enoteca receives the Local Food Champion certificate from Erica Lagios, Eat Local Sudbury Store Manager. “We wish to congratulate all winners and those who were nominated for their efforts in supporting local food systems,” said Mark Gregorini, managing operator of Verdicchio Ristorante | Enoteca. Other winners included the Good Food Box Program, Flour Mill Community Farm and Sophie Gingras.